Portable with countertop convenience, this chiller takes your room-temperature bottle of wine to 43°F in less than 6 minutes! Chills wine in record time! Chills beverages 90 times faster than a refrigerator. Portable with countertop convenience, this chiller takes your room-temperature bottle of wine to 43°F in less than 6 minutes! Soda and beer cans are ice cold in only 1 minute. Simply add ice and water to the Cooper's chilling chamber. Then choose the appropriate container setting and insert your beverage. Set the spin mode and wait just minutes for a deliciously cold drink. Watch the video demo and see how easy it is! Instructions included. UL approved. Plugs into standard household outlet. Silver/black. Cooper Union engineering student, Greg Loibl, designed this innovative cooling process as part of his final thesis. The Cooper Cooler name was chosen as a dedication to the prestigious institution and its founder Peter Cooper. Does it work for champagne? BEST ANSWER: Yes it does, you can set it so the bottle does not spin. I used for about five bottles last Christmas. Ready in 5 minutes or so. Very handy device. How long does the water and ice lasts in there? How often would I have to change out the ice? I'm planning on using it for a long time span. Does each mode only work for a specific amount of minutes? Two trays of ice will chill two wine bottles. You will need 300 grams of ice per wine bottle. If you want to chill 10 wine bottles, you will need 3kg of ice or 6.6lbs. Yes, each mode is basically a timer. A can is 1 minute, bottle is 3 minutes, and wine is 6 minutes. Each mode works according to type of product and container. There is a set time span. You will have to replace the ice & water several times per day. will it hold and keep cool an opened bottle of wine with the cork in it for up to an hour? BEST ANSWER: This item is really meant for rapid cooling, it will not hold the temperature of the bottle for a long period of time. It only rapidly cools the bottle about 6 minutes after which you would need to move the bottle to the fridge or an ice bucket to hold the temp. What is the warranty period and what does it cover? not cover? Seeing the image shown, it doesn't have temperature control, how will I be able to tell it is in the right serving temperature? BEST ANSWER: There are preset settings. 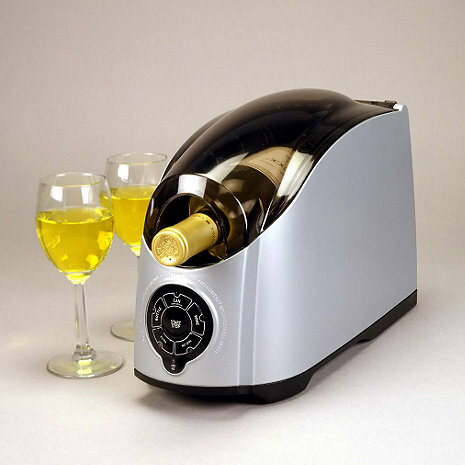 You will pick option suits your needs and the unit will chill the wine to that preset temperature in minutes. The video that is available under the picture on the units page is very helpful as a tutorial. Can you use this cooler to chill a champagne bottle? BEST ANSWER: Yes, the Cooper Cooler will hold a Burgundy shaped bottle. I like this for spontaneously chilling white wines that I keep in my 55 degree celler. It does a fine job of that but would be twice as useful if it held the wider sparking bottles. I don't think I have any sparklers that will fit actually. This cooler works very well. It works with wine and soft drinks. I would not hesitate to buy this again. We love it. This is our second one. If you drink white wine and may not always have one chilled when you have the urge then this is perfect. You can have your white wine, at the perfect temp. in just a matter of minutes. We use ours so much we wore out the first one. We bring ours in the Motor home with us because refrigerator space is at a premium. It certainly does do what it advertises, which is to chill a bottle of wine, or beer, sodas, etc. in 3 minutes or less. But, wow, is it ever loud. And it requires that you fill it up with ice (2 trays) and water, which then sprays around while it's spinning the bottles at high rpms. Kinda scary. We often have unanounced guests who like white wine. This product cools the wine in about 6 to 8 minutes and is intertaning while doing it. Great product for use in the kitchen. Have tried many others, but this is definitely the fastest! Does exactly as promised. Looks great on the counter & so convenient at the wet bar. A breeze for clean-up. Love, love, love this wine cooler! Works great, cools a bottle of wine in six minutes to the perfect temperature. Is small, looks great on a dining room side table, and its stainless steel exterior blends with other appliances. Great buy! It chills the wine (I prefer Pino Grigio) to the perfect temperature, and quickly. It's a little noisy, but I think it would be a great addition to any home entertainment area with a bar. No need to keep all the wine chilled, chill it as you need. Works well, chills a bottle in 6 minutes. It would be great if you didn't have to add Ice and water. Just the ticket for unexpected company. Don't use if you want to save the label. Excellent addition to wine accessories..
Cooper cooler okay for certain things. If all you want is to chill a can of soda or beer this is a decent product. Unfortunately, I cant recommend it for chilling wine. My experience was that even in the wine mode water splashed everywhere, because the lid could not close enough to keep it from spraying water. I cant recommend this product for chilling wine. Good for chilling any canned drinks. I bought this thinking it would cool the wine in 10. Invites or less; however, it takes at 20. Invites. I could put my wine in the freezer for this amount of time. I did not read the facts well enough. At first I was very impressed with the performance; however, after the sixth bottle the mechanism to spin the bottle stopped working. Don't waste your time or money on this product, use a bucket of ice water!